CHICAGO---Billing Solutions Inc., the leading provider of 900 Third Party Support Programs for the Banking Industry announces the launch of the industry's first IVR based Check Verification Hub. 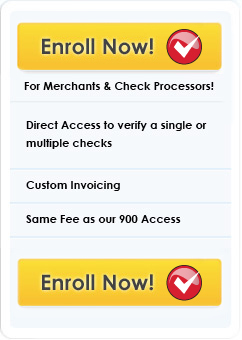 WWW.VERIFYACHECK.COM™ allows merchants check processor to perform a Multi Bank Check Verification through a single resource. In March 2005, BSI launched www.bankvod.com which is utilized by over 60,000 Mortgage Brokers, Banks and Merchants on a daily basis. Billing Solutions is involved in over 90% of the major bank's Third Party Verifications. Billing Solution’s programs/products addresses the pressing need for replacing slow inefficient, multi vendor support programs with a Single Source for Third Party Bank Verifications.